A young girl gets into trouble after meddling with her grandmother’s potion and setting off an explosion. When an angry mob discovers their secluded house in the woods, she must use what she’s learned to save them. Sabrina was born in Great Falls, Montana into a military family. This meant continually moving around the country and seeing new sights all throughout her life. Latching on to the magic of those childhood experiences, Sabrina’s work has always been about narrative and a lighthearted, inquisitive outlook in life. She attended high school at Sparta High School in Sparta, Wisconsin where she experimented more with design and personal growth as an artist. In 2013, two days before graduating from high school, Sabrina won the Doodle4Google scholarship contest where her work was featured nationally on the Google search engine. This launched Sabrina into the professional art world and it continued through college at the Minneapolis College of Art and Design where she discovered a love for 2D animation. Now, Sabrina is striving to build a strong portfolio in Animation, Concept Development, and Illustration to bring to the world all that an imagination can create. 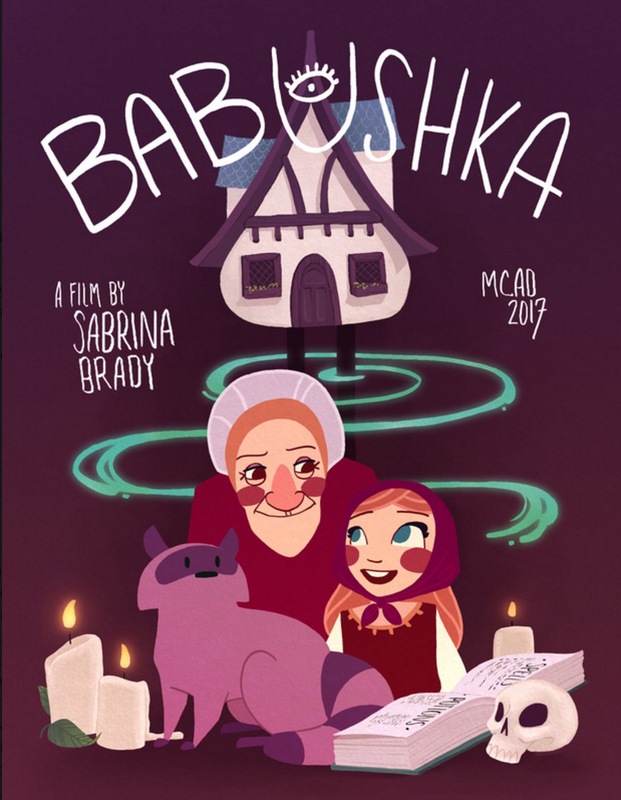 My goal with my graduation film Babushka was to create an embodiment of childhood and explore the lighthearted, inquisitive outlook children have in life. While this can sometimes lead to mishap, I often find beauty in childhood mistakes and really wanted to bring that to life. Even though my film is filled with sorcery, mobs with pitchforks, and a pink raccoon, the underlying story is that of regular family interaction and the beauty of childhood. In the film, a young girl gets into trouble when she meddles with her grandmother’s potion and a series of events unfold. Soon, an angry mob threatens their secluded home in the woods and she must use what she’s learned to save her family. I loosely based the story around the folk tale of Baba Yaga: an evil witch who lives in a house on chicken’s feet. With my target audience being children, I wanted to explore the world of magic and excitement without losing the basic family relationships of everyday life. I want children to feel as though they could easily be one of the characters, fitting right into the mindset of the little girl or tying similarities to their own family, regardless of the fantasy atmosphere. This is why the bulk of the action does not start until halfway through the film. The entire intro is dedicated to solidifying the personalities of the characters as well as their relationships to each other. For the aesthetic of the film, I wanted to pay my respects of sorts to classic Disney animation while still experimenting with my own abilities as a creative. With very flat to picture plane compositions and movements similar to those produced with a down-shooting camera, I really attempted to mimic the style of those older films. I hoped that by exploring these ideas, I could capture childhood and remind adults as well as children of their own inquisitive wonder.